At ISCG we design inspiring workplaces for our clients, but we also make it a priority to keep our own workplace exciting. This past year almost every part of our showroom received some type of renovation. New furniture, wallcovering, paint, lighting, flooring, updated new fabric/paint; no space was left untouched in our showrooms facelift. It’s important to us that we keep our showroom updated with the latest trends. We also, like many of our clients, needed to add some additional workstations due to growth over the last two years. Tasked with the same challenges we deal with on a daily basis, we set to reconfigure some areas to accommodate more workstations without taking away from the much needed social spaces throughout the office. 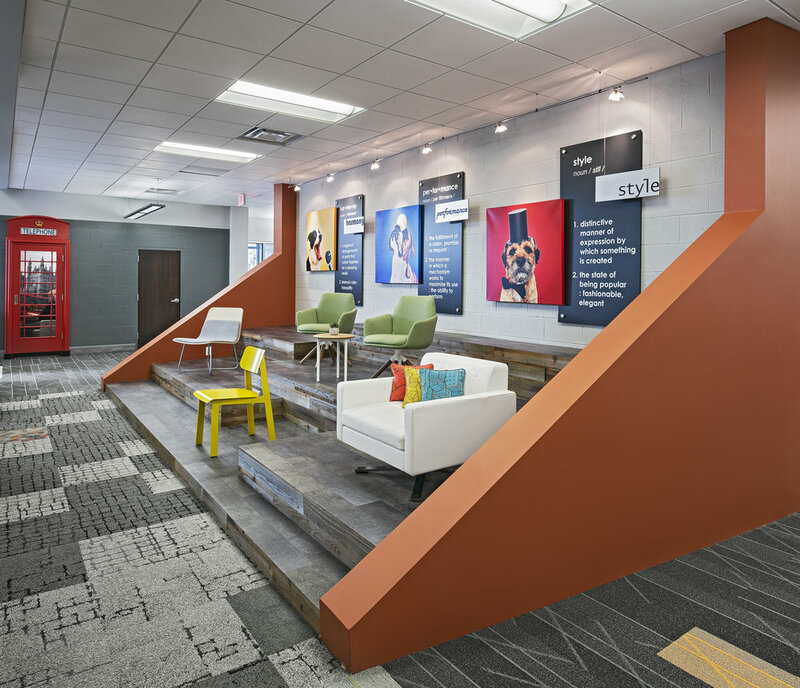 The focal point of our renovation was the transformation of our old lobby space into our Customer Experience Center and the recreation of our lobby in our front window space. The Customer Experience Center was created using Haworth’s Enclosed Frameless Glass with a film placed on it to reduce glare and provide privacy. Inside, we combined a 60” touchscreen television equipped with Bluescape software to maximize collaboration, tackboards to display the creativity of our interior designers and a wood feature wall to drive inspiration. Our lobby area is now two inviting spaces that are divided by an 8-foot custom decorative metal wall and a unique pattern of shag carpet tiles, which provides a more ‘resimercial’ feel. If you’re interested in learning more on how to give a commercial office a homey touch, check out our blog on “Why Accessories Matter”. Several budget friendly updates were also used to revive existing products. Fabric seats and ottomans were reupholstered, we replaced chair backs with a new color, and even switched out worksurface tops for a new laminate. We also updated the wallcovering in our café and gave our showroom a new coat of paint. Last January, Michele provided us with “Seven Ways to Refresh Your Workplace on a Budget” and we actually used all of them! Take a look below at some of the subtle, and not- so-subtle transformations! The updated wall-covering and additional seating truly make our cafe a welcoming place for employees and guests alike. Updating the fronts of the cabinetry provide a subtle change that improves the overall look and feel. 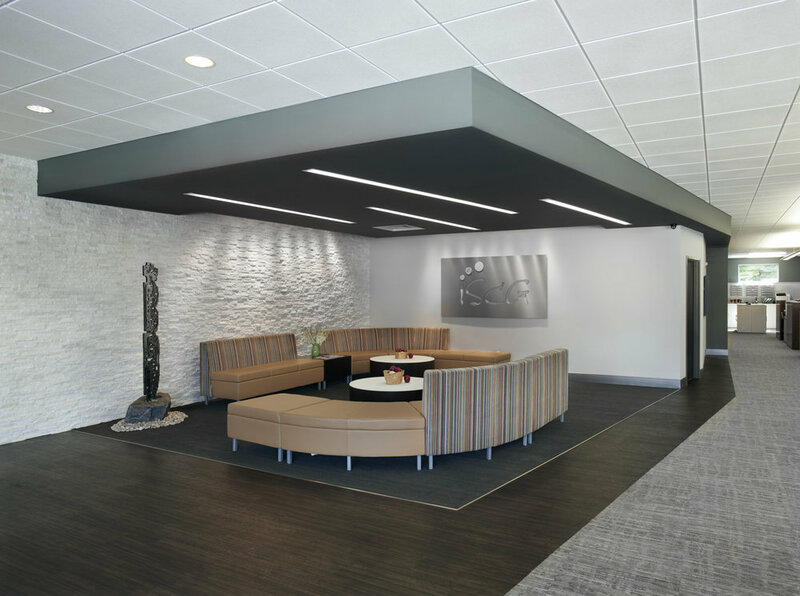 We realized that our often unused waiting area had tremendous potential as an additional conference room. We reconfigured our waiting area and added a full enclosed meeting space complete with Bluescape software. Seating updated to include new offerings like the Haworth Fern and Haworth Soji task chairs. Updated comfortable seating adds to the on-trend resimercial style. Updated paint and carpeting completely transforms the whole area with fresh colors and patterns. More seating options make our presentation area a perfect fit for large groups or company-wide meetings. Updated carpeting and paint compliment the custom wall graphic. Updated carpeting plus the addition of reclaimed wood and wall art make this area the perfect backdrop to showcase the unique seating we offer. 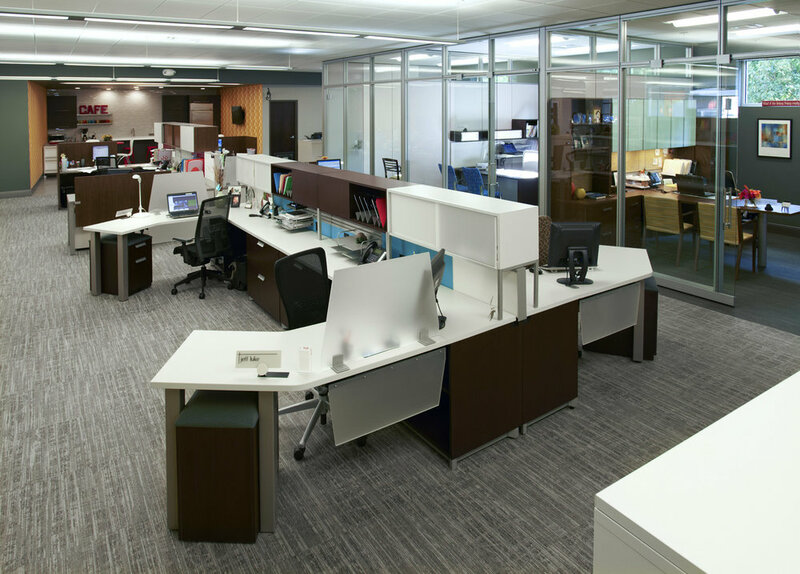 Updated workstations create a completely different vibe for the entire space. Our team is able to better collaborate on mutual projects with the lower height of the panels. 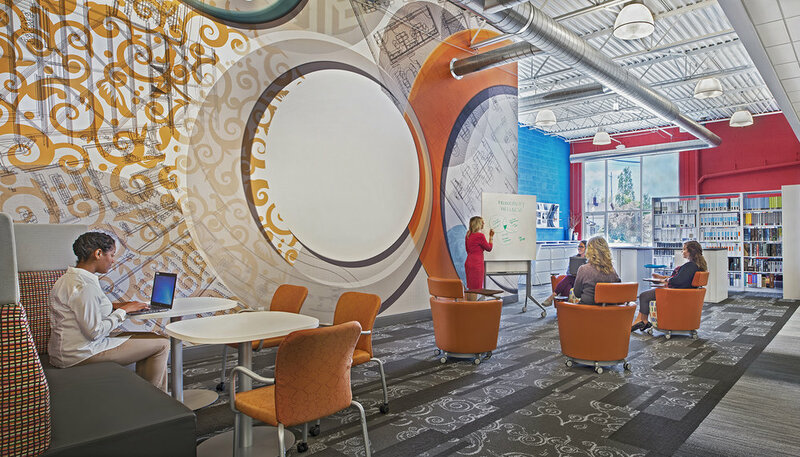 The bright colors make the space warm and inviting and open while the dark wood and high panels created barriers that inhibited creativity and collaboration. If you would like more information about the solutions we provided and how they can benefit your space give us a call. We’d be happy to help and show you how ‘inspiration starts here’.